bedroom (King bed in bedroom and queen sleeper sofa in living room). Two televisions (living room and bedroom), CD player. Private 3 building high rise (11 floors) complex with 4 clay tennis courts (no charge), heated fresh water pool with numerous lounge chairs for sun tanning or relaxing, showers, shuffleboard, outdoor cooking grills, washers and dryers in all 3 buildings. Newly remodeled, fully equipped kitchen with a dishwasher, King bed in large bedroom, Queen sleeper sofa in living room. Full sized bathroom with shower and tub, full sized closet. Two Televisions (living room and bedroom). Ceiling fans in living room and bedroom, air conditioning. 4 clay tennis courts on site(no charge) Heated fresh water pool Shuffle Board Shopping Center and restaurants 1 block away Marina with boat rental and charter trips/fishing 1 block away No smoking(easy access to ground floor patio and open air grassy area for this activity). No Pets(kennels are available if needed). Location was superb and view was good. Condo was clean when we arrived and as it was after midnight when we arrived, a light had been left on for us. Condo was well stocked with kitchen supplies and towels. The beach chairs that were provided were old and rusty and could not be adjusted. Very uncomfortable, so we had to go and buy beach chairs (which we gave to friends at the end of our stay...we were out $50). There was a new umbrella in the closet and this is essential for the beach. So, thank you! This condo is in need of updating. Carpet showed wear and dirt as did the sofa. The kitchen was acceptable, however, I would have preferred that the refrigerator open with the handle on the right. Logically it made more sense, but we lived with having to move around the door. The bathtub/shower combo was not in good shape. The faucet/spout was loose and we never did get all of the water to come just out of the shower head and not out of the spout as well. It is a waste of water. The tub did not drain properly, so we stood in water as we showered. The shower doors were old and had mold on the sealant. Wallpaper was coming off the wall. The toilet did not flush well so we had to hold the handle down for a bit. The vertical shades on one window in the bedroom were missing vertical pieces and one fell off the night we arrived. All in all this is an acceptable condo that simply needs some TLC. We were kept well informed by the owner, and appreciated that. In speaking with other renters, other condos were in the similar condition. We will come again. 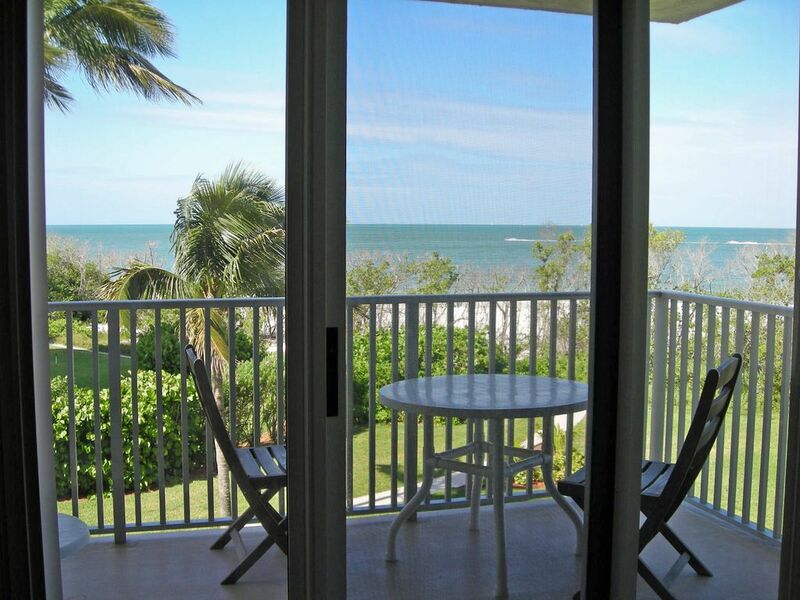 Wonderful condo stay on beautiful Ft Myers Beach! We loved our stay!! The condo was perfect for us and we really enjoyed our stay in Fort Myers Beach! We were very impressed with the brick driveway and beautiful fountain as we drove into the building. My husband and I really enjoyed our visit at this condo. The pictures didn't do it justice. The ocean view from the balcony was even more impressive than the photos could show. The instructions Maggi gave us made everything very easy.and accessible to all the facilities. We would definitely rent this condo again! Thank you! I'm glad you enjoyed your stay. Great condo and had a beautiful view of ocean. Maggi was easy to contact and responded quickly. Easy access to beach and very clean unit! Hope to rent again! Thank you. I'm glad you enjoyed your stay. Very nice condo . Great view of the beach and the pool was great. Lots of restaurants and shops across the street. Our first time staying this far south. Owner got back to us fast and was very nice. Hope to rent from you again. Glad you enjoyed your stay. Thanks! parasailing, boat trips to Key West. facilities,Downtown Fort Myers, and Naples. Prices include 11% Tourism Tax Cancellation policy -- If cancelled more than 60 days prior to arrival, the first payment will be refunded. If cancelled within 60 days of arrival, a refund will be available if the property can be rented for the same time period.